Updated for 2019: I wrote this post before modern-day conveniences like NUTPODS were introduced! I used to buy canned coconut milk and use it in my coffee maker. Now, I just use Nutpods. So, go buy yourself some Nutpods and get to drinking your coffee. It’s Whole30 compliant and EASY! Watch their website for seasonal flavors like pumpkin spice and peppermint mocha (which is oh so creamy and delicious!). What can you use nutpods for? When I placed my first order, I received a quick email with ideas for what to use nutpods in. I loved the suggestions and wanted to share them with you! Use it as a base for a mushroom bisque, clam chowder, or other creamy soup. Pour it over whole grain oats, seeds, and dried fruit and let sit for 10 minutes for a hearty breakfast. Froth nutpods for a delicious latte or mocha. Add to your chai tea for a warm afternoon pick-me-up. Sub out the milk in your pancake, quiche, or chicken pot pie recipes. In the summer, add it to your iced coffee or tea. Whip up a creamy dairy-free ranch or green goddess dressing for all types of salads. Take it on your upcoming road trip or camping adventure – it’s shelf stable until opening. Take nutpods on vacation – it’s the perfect size for your hotel mini fridge. Before I started Whole 30, I read a lot of negativity on giving up certain foods and drinks. It made me question whether I was strong enough to conquer my cravings and complete this challenge. Not drinking has been pretty simple since I haven’t gone out much. I’ve committed to being a homebody for the majority of this challenge, and I am fine with that. But, coffee? I can’t give that up. I don’t want to give it up. Luckily the creators of Whole 9 Life don’t think you have to. You just have to change how you drink it. “Yes, you can have your coffee. You’re welcome. You can drink it black, add compliant coconut milk or home-made almond milk, or add cinnamon or vanilla beans to the brew. But remember, Whole30 guidelines exclude milk, cream, non-compliant milk substitutes, and added sweeteners—including stevia.” So, yes, Whole 30 coffee is allowed! I’m the kind of person who orders White Chocolate Mochas at Starbucks, I take my Dunkin’ Donuts coffee with extra cream and sugar (the REAL stuff, no artificial sweeteners here), and I never drink hot coffee. Never ever. Not even in the middle of a Florida winter and my hands are freezing. I’ve been asked multiple times if my coffee is really chocolate milk or perhaps a White Russian. While both of those are tasty, they aren’t exactly things I would bring to the office to sip on. I found a few articles about Coconut Milk as a coffee sweetener, and I knew that I needed to try it. I wanted to see if I could make a blend that would be Whole 30 compliant and delicious. First up, selecting the right kind of coffee. I needed something light and flavorful, so I tried The Coffee Bean’s Mocha Java. I purchased a coffee bean grinder, and I started using my new Iced Coffee Maker. I found a Mr. Coffee Iced Caffe maker for $17 on the clearance rack. It’s basically just a coffee maker with a pitcher instead of a pot that you fill with ice. It does the job. I call it a win. Once the coffee is brewed, I add in a splash of Trader Joe’s Light Coconut Milk. The only ingredients are coconut milk and water. It mixes nicely with the coffee, and it tastes great. Does it taste as good as REAL sugar and cream? Well, no, but it tastes comparable. I am willing to sacrifice taste for health! I have also learned that it really is dependent on the kind of coffee you brew. I tried coconut milk in a Breakfast Blend, and it tasted awful. 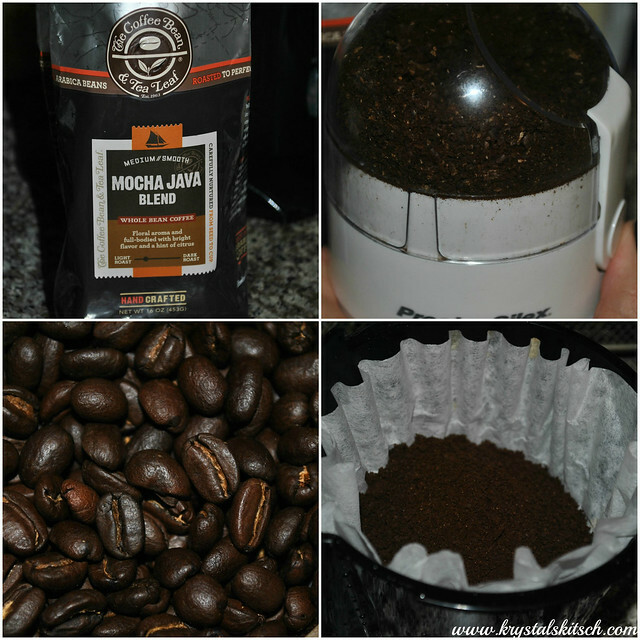 I re-ordered my Mocha Java beans because I just can’t complete the Whole 30 without them! 😉 I enjoy my morning coffee, and I am happy I do not have to give it up. You can read more about Whole 30, the Whole 30‘s Coffee Manifesto, or buy the book It Starts With Food: Discover the Whole30 and Change Your Life in Unexpected Ways . Read my Whole30 category here! Yes, you can have coffee while on a Whole 30! Try this coconut milk coffee to satisfy your sweet tooth. Whole 30 Coffee is possible! I wouldn’t be able to give up my coffee either… but I need my sweetener (just a tsp) that’s all! Good for you for doing this! I can’t wait to hear more. I just bought some of that coconut milk from Trader Joe’s. Good idea! Good for you! Can’t wait to read more of your Whole 30 journey! Never would have thought of coconut milk as an alternative to cream and sugar — and I’ve been wanting a different option for a long time. I’m definitely going to give it a try! Thanks for sharing! I think it’s great you are doing this! Every time I see your food pics on Instagram they look so yummy. I keep telling myself I should look into this Whole 30 program! I once did a whole 30 and really didn’t have any trouble giving up certain foods, not even sugar which is what I thought would be the hardest. I think it’s a mental game. If you want to succeed with it, you will. If you want to spend the Whole 30 thinking about what you can’t have, then you’re going to have a tough time. Coconut milk-I’d hoped it would be good in my coffee, but I just can’t stomach it. I don’t mind using coconut cream though. I’ve whipped it and used it on strawberries. Very delicious. I really couldnt live without my coffee so you made the good choice! I don’t drink coffee but that’s a smart idea to add light coconut milk to save calories! I’m not a coffee drinker, even though I tried so hard in college to get on the “coffee train” (Think mid-90’s explosions of coffee houses and Starbucks) 🙂 However, to my uninformed palate, this sounds delicious! This post was chosen as a feature on this week’s Pimp Your Pinterest! The link up will go live on Wednesday evening. 🙂 I’m getting ready to do a cleanse, and I am super worried about coffee. My only concern with this would be what was in the coffee you used? Since it’s Mocha Java, what did they add to the coffee to make it “sweeter”. That might make it not whole30c compliant… I know that’s being extremely strict, but I’m really trying and coffee is my sticking point so far, too! I don’t have a bag of this handy right now, but I do know that I’ve purchased a few other flavored coffees at Target and noticed the “artificial and natural flavors” ingredients right on the bag. Usually you can find it easily. I will have to check this out the next I grab a bag of this coffee. I’m not strictly on Whole 30 anymore, but I will say this helped me get through my cravings! I have never tried coconut milk with coffee. I am curious about how it will taste though.